1) Trees should be watered regularly. Do not be deceived by the odd shower. Young trees need readily-available moisture in the rooting zone, to be able to establish a strong healthy root system. 2) Weeds and grass around the trunk of the trees are a real setback for the trees at this stage. 3) Greenfly and caterpillar are munching away on the young newly formed leaves. Do not let this situation get out of hand. 4) Young trees will do well with extra foliar feed during the period May to August. 5) This is also the time to reduce the number of fruitlets on freshly planted trees. 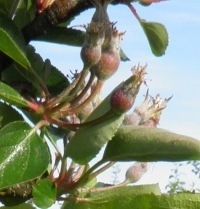 Too many fruitlets will take away the energy needed to create healthy shoot growth and root growth.